Through the Eyes of an Intern, No. 5: Rescues /Hawks Aloft Inc. I finally had the chance to go on my first few rescues. Most recentl of which was a Western Kingbird, which is now recovering from its twisted knee joint; a Cooper’s Hawk with severe head trauma; and a Great Horned Owl, camping out on a family’s fence because of a broken left wrist. He was beautiful and impressive even in his crippled state. I don’t think I’ll ever forget casually glancing at the box into which Lisa, our rescue coordinator, had just wrestled him, and suddenly seeing nothing but one luminous, sunflower-yellow eye neatly filling one of the air holes in the box. No wonder great-horns are so often seen as symbols of power and strength; I wouldn’t even dare call the chicks “cute,” they’re too intimidating! We are unsure of his prognosis, but I’ll keep you updated for sure. Well, that woke me up. How could I say no? The one part of Hawks Aloft that I had not yet experienced was rescues, aside from the occasional raptors Lisa would bring in like just another briefcase and keep in the office while she finished up her computer work. (I kid! She treats all the birds with a healthy dose of respect and love, and if I were an injured bird, I’d certainly want her to be the one taking care of me!) We hopped in her car and headed for a vague address in Moriarty. An hour and a half later, I felt nothing but gratitude for the inventor of GPS and a burning curiosity as to what a rescue actually involved. Running around after a panicked bird? Bandaging wings and consoling stricken house owners? Pulling into a beautifully landscaped yard, I was surprised to see the husband actually sitting on the lawn less than a foot away from the bird, which he had been able to approach and take in from his field. Pro-tip: you don’t want your face that close to talons that sharp, much less to pet it just inches away from an equally sharp beak. But I digress. Lisa identified it as a juvenile, probably female, Prairie Falcon, and quickly got to work, first picking up the falcon and looking at its head, then examining its wings for fractures. 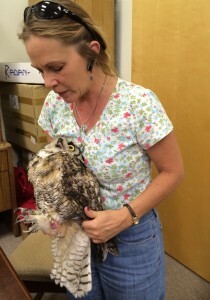 Here’s where it got interesting for me, since the falcon was clearly well enough to start biting Lisa’s fingers midway through the wing exam: I got to hold the patient! This involved two fingers of one hand around its neck and three of the other around and between its legs, securing its main defenses. After finishing with the wings, which seemed to be in fine condition, she force-fed it a liquid containing amino acids and various other nutrients, wrapped it in a towel, and set it inside the cardboard pet carrier she’d brought with her. And that was that. Pretty standard procedure, from what I’ve watched of other rescues Lisa has performed; a quick physical and some hydration, then off to a caretaker’s house or a vet’s, depending on the severity of its injuries. 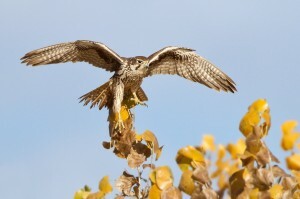 A couple days later, she reported that the Prairie Falcon would be unreleasable due to near blindness in one eye. We’re hoping that it can become an Educational Ambassador. Fingers crossed that the permit comes through soon! I really enjoy going out on rescues, the feeling that I’m doing something to improve a bird’s life, even if that improvement is euthanasia. Loss is a very real aspect of rescue work, and I think it’s probably a good topic for me to learn about in this small and humane way. Buddhism preaches non-attachment and acceptance of life’s innate mutability, but I’m pretty sure anyone could learn that much more personally from just one day’s experience as a rescuer. To end on a happier note, though, I saw two raptors on our drive to and from picking up the Prairie Falcon. I later identified them (all by myself! go me!) 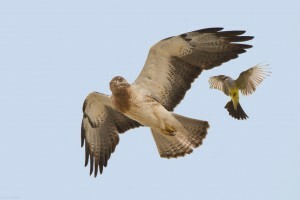 as light-morph Swainson’s Hawks, the first time I’ve seen them as far as I know. Anytime I feel stuck—in my work, relationships, day-to-day life—I think about these beautiful raptors, who soar through the sky and make even the mundane necessity that is hunting a majestic occasion. I’m learning that if I keep my mind as open as their prairie habitats, anything can be awe-inspiring in its own small way.